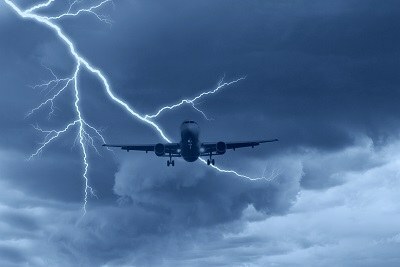 Lightning near a plane. Source: Shutterstock. Lightning can produce X-rays and gamma radiation. In the past, researchers thought that this phenomenon only lasted for a very short time, about a ten thousandth part of a second. However, the ionizing radiation of lightning appears to shine much longer than presumed: an afterglow of gamma radiation arises, which lasts up to 10,000 times longer. This is demonstrated for the first time by computer simulations of researchers from Centrum Wiskunde & Informatica (CWI) in Amsterdam. Their article 'TGF afterglows: a new radiation mechanism from thunderstorms' was published on 22 October 2017 in the scientific journal Geophysical Review Letters. This discovery can provide more insight into how lightning develops. ‘Terrestrial gamma flashes’ were discovered about two decades ago. When lightning starts, electrons can be accelerated to very high energies, which cause an explosion of gamma radiation when these electrons crash into air molecules: the so-called terrestrial gamma flashes'. Bursts of up to a trillion (‘a billion billion’) gamma particles are measured on the ground, in airplanes and by satellites. However, these measurements are difficult, since these bursts are very focused and only last for a short time, around 0,0001 seconds. There is still much unknown about how these terrestrial gamma flashes arise and what their role is in the development of lightning. The now discovered afterglow helps to study this phenomenon. CWI researcher Casper Rutjes explains what happens in the newly discovered radiation mechanism. “The radiation of a terrestrial gamma flash is so strong that nuclear reactions can take place. When the gamma rays hit the atomic nuclei of the air molecules, the protons and neutrons, of which atomic nuclei exist, can be detached. The loose neutrons can wander longer and farther than protons because they don’t have electrical charge. After a while, the neutron is captured by another atomic nucleus, which can again produce gamma radiation. The high energy of the gamma ray flash, which is used in releasing neutrons, is, so to speak, temporarily stored in the released neutrons.” The CWI researchers calculated that in this way an afterglow of new gamma radiation occurs, which lasts for 1,000 to 10,000 times longer than the gamma ray flash itself and which is not focused but radiates into all directions, which facilitates measurements. The CWI researchers found in the scientific literature hardly any measurements that corresponded to the predictions, because almost no one was done on the right time scale. 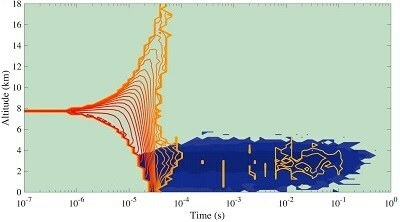 Researcher Casper Rutjes says: “Recently, our simulations have also been confirmed by experiments. Almost simultaneously, G.S. Bowers et al. of the University of California Santa Cruz, have measured a clear afterglow of gamma ray flashes in Japan, after a lightning bolt struck a wind turbine. That article, ‘Gamma-ray signatures of neutrons from a terrestrial gamma-ray flash’, also appeared now in the scientific journal Geophysical Review Letters. The research was conducted by Casper Rutjes, Gabriel Diniz, Ivan Ferreira and Ute Ebert from Centrum Wiskunde & Informatica (CWI) in Amsterdam, and it was funded by the Netherlands Organisation for Scientific Research (NWO). Simulations by CWI researchers showed an afterglow of gamma radiation after lightning, which lasted up to up to 10,000 times longer than previously assumed. The image shows the altitude and time of the radiation. The color (red to yellow) indicates the radiation strength. A terrestrial gamma flash that starts at an altitude of 8 kilometers, creates a cloud of neutrons (blue) at an altitude of 3 kilometers. This cloud, in turn, creates the afterglow. Dwyer et al. (2010). Estimation of the fluence of high‐energy electron bursts produced by thunderclouds and the resulting radiation doses received in aircraft. Journal of Geophysical Research: Atmospheres, 115(D9). Bliksem produceert nagloed van gammastraling Bliksem wekt röntgen- en gammastraling op. De ioniserende straling van bliksem blijkt veel langer te schijnen dan tot nu toe was aangenomen: er ontstaat een nagloed van gammastraling die tot wel 10.000 keer langer duurt. Dat blijkt voor het eerst uit computersimulaties van onderzoekers van het Centrum Wiskunde & Informatica (CWI). Hun artikel ‘TGF afterglows: a new radiation mechanism from thunderstorms’ is gepubliceerd op 22 oktober 2017 in het wetenschappelijke tijdschrift Geophysical Review Letters. Deze ontdekking kan meer inzicht geven in hoe bliksem zich ontwikkelt.